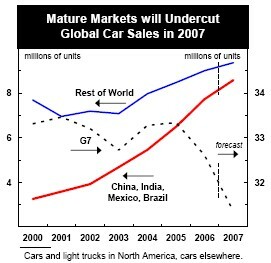 After five consecutive years of record sales, global auto volumes are expected to be flat in 2007, as weaker sales in the mature markets of the United States, Canada, Western Europe and Japan will offset strong momentum in China, India and Latin America, according to Global Auto Report by Scotiabank. China became the world’s third-largest car market in 2006, as car sales in China soared by nearly 40% in 2006 to 4.1 million units, surpassing the 3.4 million sold in Germany. China should become the world’s second-largest car market before decade end, as low vehicle penetration, rising incomes, greater credit availability and falling car prices lift sales past those of Japan. Vehicle penetration in China stands at only 24 per 1,000 people, compared with 749 in the mature markets of the G7. With only 1% of the population owning a vehicle, annual sales in India are expected to climb to 2 million units by the end of the decade, as sales jumped nearly 20% in 2006 to nearly 1 million vehicles. Manufacturers like General Motors Corp, Suzuki Motor Corp., and Hyundai Motor Co. Ltd. plan to invest more than $5 billion through 2012 in India. Vehicle sales in Latin America will continue to post solid gains in 2007, buoyed by economic growth in excess of 4% for the fourth consecutive year. Solid economic growth — in excess of 3% — and ongoing reductions in interest rates will lift Brazilian car sales to a record 1.6 million in 2007. U.S. passenger vehicle sales declined by 3% to 16.5 million units in 2006, pressured by high gasoline prices and slowing economic growth. Scotiabank expects 2007 US sales to slump below 16 million units for the first time since 1998. 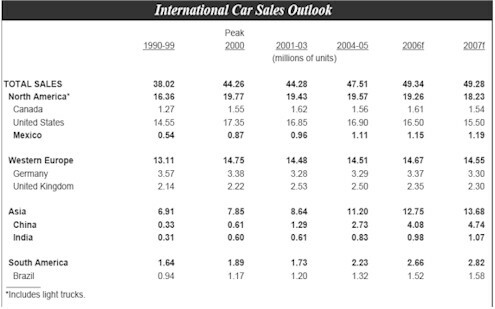 In Canada, car & light truck sales are expected to decline to 1.54 million units in 2007, down from 1.61 million in 2006. Some 49.34 million autos are expected to be sold in 2006, with North America accounting for 19.26 million vehicles, Western Europe 14.67 millions, and Asia with 12.75 million autos.